These See Through 1" scope mounting rings are designed to allow use of your iron sights even while you have a scope mounted. 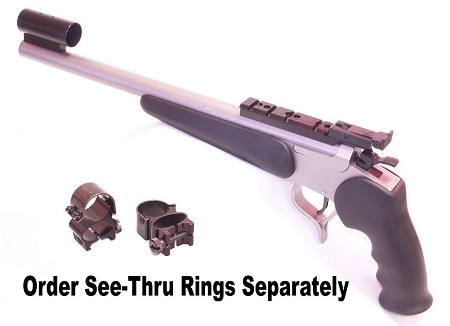 We've found them especially useful for their extra height when used with our ScopeRib III Silhouette Sight System and PeepRib Muzzleloader Sight Systems (See Below). They also fit perfectly on any Weaver or Picatinny mount. A side benefit of these rings is their Repeatability. Customers report that scopes will maintain almost perfect zero when using these rings and taking scopes off and on in the field. This is an excellent feature when you need to adapt to changing conditions.